I posted this a few years back, but since we're talking about Bureau 13: Stalking the Night Fantastic this week, it seems like this is worth a re-post. When we first started playing B13 - circa late 1990 or early '91 - we didn't have easy access to a copier, so our "character sheets" were handwritten on legal pad or loose leaf paper. 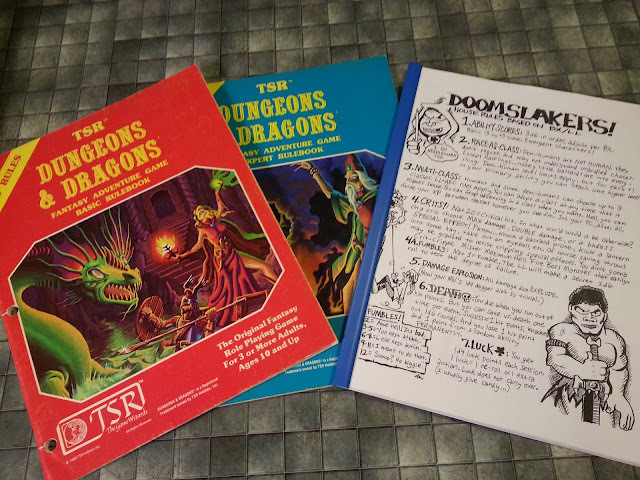 (I still remember getting writers cramp - you young folks might need to Google that - while prepping for an upcoming game with almost a dozen players, each of whom needed a new, blank character sheet. Ouch.) Later (around 1993) when I bought my first inkjet printer, one of the first things I learned to do was use AmiPro to create character sheets for our favorite games. That gave birth to a love of creating character sheets that lives still. Our B13 sheets have gone through many designs over the years, evolving finally into my ultimate sheet several years ago. I'm still very happy with this sheet, so aside from possibly making it look more like an official, preprinted and fillable form, I don't see any major changes being made to it anytime soon.